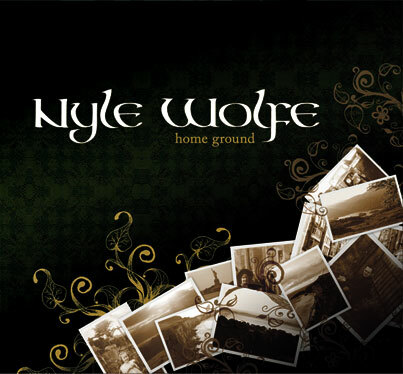 “Home Ground” is an album from Ireland’s voice of luxury Nyle Wolfe. It is a beautiful collection of nostalgic Irish songs including Maire My Girl, Red is the Rose, Molly Malone, She Moved Through the Fair and Danny Boy. Recorded in New York at Kampo Studios in January 2009, Nyle is accompanied by an impressive international line-up. New Yorker Jeff Lipstein plays percussion. Jeff has performed with artists such as David Johansen, The East Village Opera Company, Blue Man Group and Rebekah Jordan. Jeff is currently performing the Broadway production of “Spring Awakening”. Both acoustic and electric bass are provided by kiwi, Richard Hammond. Born in Dargaville, New Zealand Richard moved to Auckland at age 18 and quickly became one of the most in-demand bassists, performing and recording with New Zealand’s top artists, including Nathan Haines, Mark de Clive-Lowe, Moana & the Moahunters, The New Zealand Symphony Orchestra and Tim Finn. Tara Novak shines on violin and also contributes to many of the arrangements on the album. Tara ascribes her broad range of technique to her years spent studying with the international concert violinist Benny Kim, time spent at Berklee College of Music, and the diversity demanded of a free-lancing musician. Busy on flute, clarinet and soprano saxophone, Hawaiian woodwind player Allen Won adds an extra cultural element to the collection. Allen’s eclectic performance itinerary has encompassed playing with the Chamber Music Society of Lincoln Center, many of the orchestras in and around New York including the New York Philharmonic, the New York City Ballet, the City Opera, The New Jersey Philharmonic and various jazz and experimental groups. The vast talent of David Wray solidifies the recording with his sensitive arrangements and beautiful piano playing. David trained at Lancaster University and the Guildhall School of Music & Drama. He was assistant to the director of The English Bach Festival, London and is currently artistic director of Music Theatre Ireland, Opera in the Open, Dublin, The Three Irish Tenors and for American songstress Danna Davis. Last but not least the vocalist, Nyle Wolfe.